Act on an impulse and order this whimsical and multicoloured bouquet of scintillating Purple Iris, lively pink Asiatic Lilies and cream coloured Gerberas for the special people in your life. 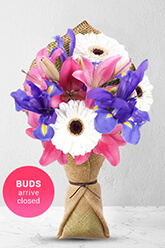 Lilies may be sent closed/partially closed in order to prevent damage and to last longerVase not included however; to add to the element of surprise, zFlowers.com recommends including a Premium Vase with your order. Flowers I ordered for mum's birthday were delivered on time. She loved them so that's the main thing. Thanks. Easy same day online booking. Family receiving flowers were very happy with them. Easy, fast and friendly service. My friend loved her flowers. Will definitely consider using zFlowers.com again! E Excellent service thank you so much. ; Margaret rang me and said she was delighted to receive the gorgeous flowers.